The other day, I was reading and listening to Malcolm X's "Message to the Grassroots" speech with my students in our Malcolm X and poetry course. I was mentioning to the students that in addition to being a skilled speaker, Malcolm was also once a poet. Maybe his interest in poetry or literary art haunts his well-known speeches. 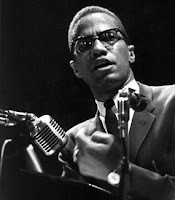 At one point in "Message," Malcolm references several historical moments in an effort to clearly define the common features of real revolutions. "Look at the American Revolution in 1776," he says. "That revolution was for what? For land. Why did they want land? Independence. How was it carried out? Bloodshed." Later, he goes "The French Revolution -- what was it based on? The land-less against the landlord. What was it for? Land. How did they get it? Bloodshed." Then, "The Russian Revolution -- what was it based on? Land. The land-less against the landlord. How did they bring it about? Bloodshed. You haven't got a revolution that doesn't involve bloodshed. And you're afraid to bleed. I said, you're afraid to bleed." He repeats the phrasing that ends in "Bloodshed" several times during s small stretch in the speech. From one perspective, by repeatedly mentioning the word blood, Malcolm encourages his audience to see red. He clearly wanted to urge the audience to become more militant and discontent with passive tactics and injustice, so getting them to see red and sharpen their anger was a deliberate move in his approach. Malcolm's approach to using distinct words to invoke particular imagery, in this case the view and idea of red, reveals a black political figure utilizing the devices of a poet or literary artist.